Each year DOG FANCY asks readers to nominate an American city that represents the very best in dog-friendly lifestyle. With careful research of each city they name the winner based on the presence of dog-centered activities, dog-friendly businesses, dog parks, veterinarian specialists, pro-dog legislation, rescue programs and other doggone important criteria. When stacked against the country’s top nominees for 2014, five cities stood out above the rest. While only one could be named DogTownUSA, all of these cities are worth a visit! Austinites pride themselves on keeping their city weird, their live music thriving, and their dogs by their side. Our 2014 DogTown USA winner also proudly holds the title of the nation’s largest no-kill city, meaning that no animal is killed there simply because he does not have a home. The nonprofit organization Austin Pets Alive! led Austin to this goal in February 2011, and the city recently celebrated its three-year no-kill anniversary. Although summers are hot in Texas, dogs can get plenty of cool-water play. 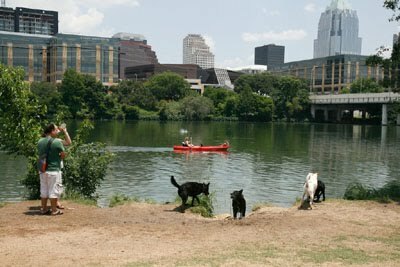 "On Red Bud Isle, dogs can play and swim off leash, and we have areas allowing access to Lady Bird Lake right in the downtown area,” Fraser says. Along with spots for dining and drinks, numerous stores in Austin welcome dogs, including Backwoods, an outdoor gear retailer, and the Barnes & Noble bookstore in the Hill Country Galleria. "Customers bring dogs into Austin Tri-Cyclist bike shop almost every day, and they’re usually greeted cheerfully by Indie, our store manager’s 5-year-old Border Collie,” says Missy Ruthven, the shop’s co-owner. Gigi, a 7-year-old Chihuahua, also relaxes on a bed next to the work station of her owner Tim Carr, a bike mechanic. 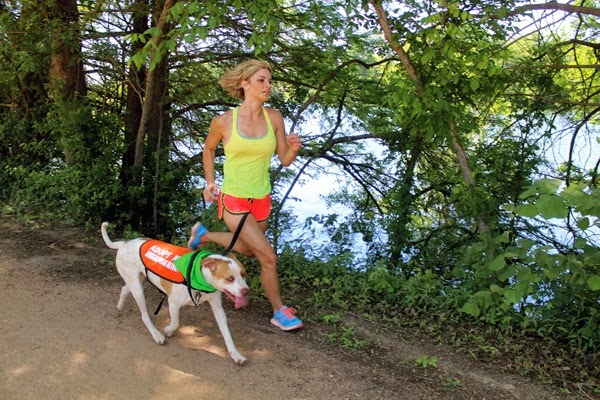 "Our dogs offer us companionship while we work to keep Austin’s many athletes fit, fast, and safe,” Ruthven says. For travelers, the city offers dog-friendly lodging options such as the Hotel Saint Cecilia and the Hyatt Regency Austin. For tourists and Austinites alike, springtime brings fields of bluebonnets as a backdrop for photography. "The ‘dog-in-the-bluebonnets’ pose is a trademark Austin photo opportunity,” Ruthven says. Animal activities and fundraisers fill the city’s calendar. Austin’s Mighty Texas Dog Walk, which boasts thousands of participants, raises money for Service Dogs Inc. Jo’s Coffee puts on an annual pet parade and costume contest, and the Wagathon Walkathon charity dog walk draws hundreds of dogs and owners. "The APA! No-Kill Anniversary Party at the Palm Door, with over 400 people in attendance, wrapped up a three-day, national no-kill conference highlighting innovative programs for becoming a no-kill community,” Jefferson says. Leashed dogs are welcome in many popular venues. You might see them touring the state capitol grounds, relaxing at the Pecan Street Festival, or watching a million Mexican free-tailed bats soar from the Ann W. Richards Congress Avenue Bridge during bat season, which runs from early spring to early fall. "The popular annual festival, Blues on the Green at Zilker Park, runs throughout the summer and is perfect for sitting on a blanket with dogs and refreshments, enjoying local music,” Bakre says. Austin is one of the few cities with an anti-tethering law, and residents can have their dogs microchipped and tagged free of charge by the Austin Animal Center. "Since 2011 no cat, kitten, puppy, small-breed dog, or readily handleable large dog has died in Austin simply because it was homeless,” Jefferson says. "We rely heavily on generous foster homes, and we continually work to cultivate increased adoption rates.” APA! holds regular adoption events and has hundreds of dedicated volunteers. After all, perhaps the only issue Austinites show more passion for than ‘Keeping Austin Weird’ is keeping the city’s animals safe.